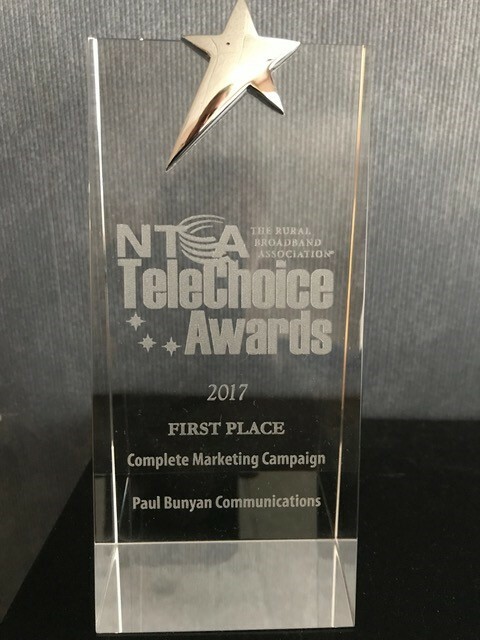 (Bemidji, MN) (May 26, 2017)— Paul Bunyan Communications has been awarded a national TeleChoice Award by the NTCA–The Rural Broadband Association during their Annual 2017 PR & Marketing Conference. The annual awards program honors excellence in public relations and marketing. Paul Bunyan Communications was given the TeleChoice Award for their complete marketing campaign of the GigaZone Gaming Championship, the first stadium style eSporting event in the region held last November at the Sanford Center. Entries were judged on innovative strategies, design, writing, creativity and other elements specific to each category. “We are honored to receive this national award for marketing. The GigaZone Gaming Championship was a first of its kind event we brought to the region last year aimed at gaming enthusiasts of all kinds. We spent a lot of time on the creative aspects of the campaign to ensure the message would resonate with the gaming community but also would appeal to the general public. It was a very successful event and one that will continue in the years to come. The 2017 GigaZone Gaming Championship is set for September 29-30 and will be even bigger and better than our first event last year!” said Brian Bissonette, Paul Bunyan Communications Marketing Supervisor.